Remember when Rapid Roulette first came out? Most People thought it would never work. However, it became successful after its first year In Vegas. A spin off of Rapid Roulette was Rapid Craps, it did not fare as well and for good reason. Now Roulette has taken yet another turn. 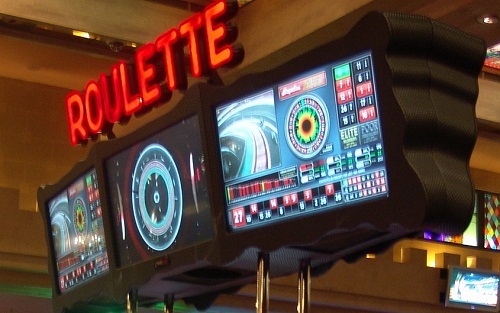 The newest Roulette in Las Vegas doesn't even have a name. Its just the New Roulette. The game is just like Rapid Roulette except for one Huge difference, there is no dealer. Now, You do not have to give Your money to some idiot that carries it on a tray over to a computer terminal and types in a bunch of keys like You are asking for a plane ticket to Hong Kong, then after three plays You finally get the money credited to Your screen. Now, New Roulette is all self service, good for the Casino's, faster and more friendly for the player but not good for Las Vegas Jobs. Now this game is years old and it is as hot as any game has ever been in Vegas. Almost every Casino has it now. The first year of operation, it was hard to get a seat and even though it is still very popular, You will find a spot. The Machines take Your money just like a slot machine, put in dollars, fives, tens, twentys or hundreds or even tickets from cashing out on other machines. As soon as You put Your money in, You will see it credited on Your terminal and You are ready to play, no more waiting on the idiot attendant. 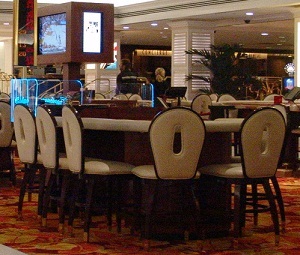 A table layout with all the live action can be seen from every seat. 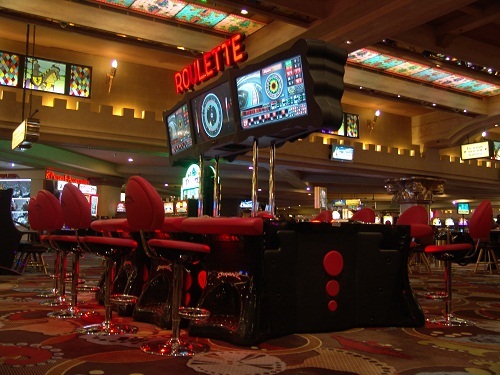 The new Roulette Las Vegas is a relaxing game to play and is now at most casinos in Las Vegas. The advantages to this roulette game over old fashion roulette are obvious. Just like rapid roulette, You do not have a chance of mixing up Your chips with the stranger next to You. You don't have someone reaching over You to place their bet while Their cigarette is in Your face. 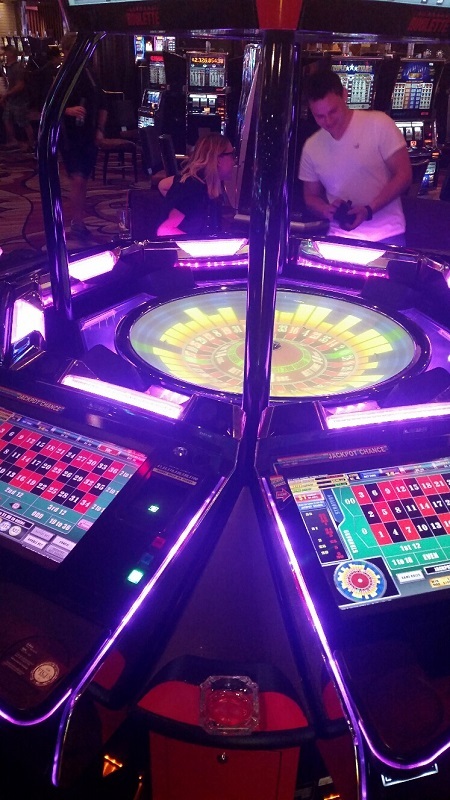 The New Roulette Wheel is enclosed so No One can interfere with the spin. Never Play this machine, it is the digital version of the new Roulette machines. Do not play the machine that is a copy of the new Roulette machines but in the Digital Version. What that means is there is no physical ball. 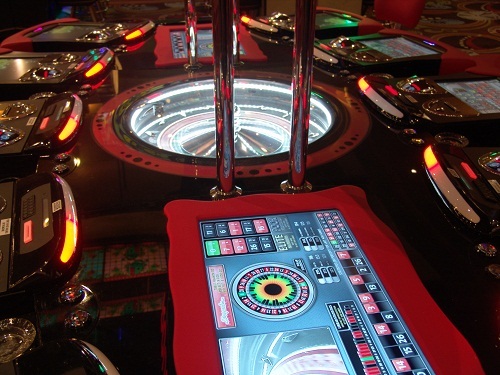 In the game with a real or Physical ball the game remains the exact same as the old fashion roulette table and is always random. In this new digital version the game is NOT random and is controlled in the same way as a slot machine. The Casino can ask it to pay out a certain amount that is controlled by a computer board. It is very easy to mistake this game for the one with the real ball because it looks just like it at the players screen and the middle looks like maybe the glass is dirty but be sure to look closely and see that the ball is not real and the numbers are not real. Can You win on it? Of course You can and maybe more than the real one but it is a set number or numbers that can come up. It is always better to play a game of chance than play a game that is already decided. Rapid Roulette is nowhere to be found in Vegas now. All have gone to the machines that require no dealer. Las Vegas is moving closer and closer to having every game operated by computers instead of People. That's not good news for Las Vegas Jobs but the only way it can work is if the new game is more enjoyable without a "live" dealer. 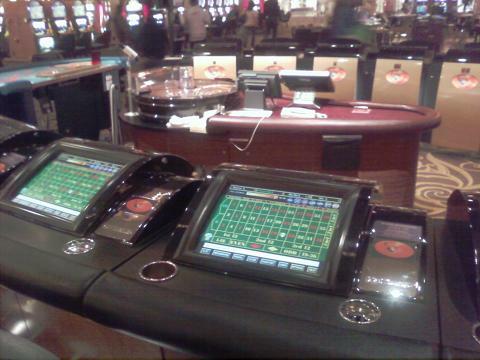 So far, the machines like the New Roulette and the New Craps are far more popular than the ones that require Casino employees. The game is faster, less intimidating and can be played at the customer's pace not the employee's.